Leslee Hill was elected to her first term in November of 2018. She currently serves on the General Assembly’s Judiciary, Education, and Finance, Revenue & Bonding Committees. Prior to being elected as State Representative to the 17th Assembly District, comprised of Canton and Avon, she was the first female Republican elected to serve as the First Selectman of the Town of Canton in 2015. In addition to serving as Canton’s chief elected official, Representative Hill was appointed to Canton’s Board of Education in 2008. She was then elected, and served for two consecutive terms on the board in 2009 and 2013, respectively. Before public service, Representative Hill practiced law. She earned a B.A. in Political Science from Providence College and went on to earn her J.D. from Western New England University. 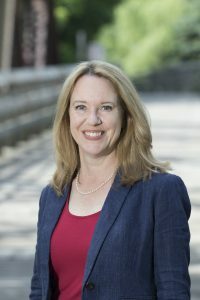 As a licensed attorney she has been admitted to the Connecticut state courts, U.S. District Court, 2nd Circuit Court of Appeals, and United States Supreme Court. She has worked in private practice focusing on general commercial law, contracts, collection, and complex foreclosure litigation.